Norumbega Mountain is the westernmost peak on the eastern side of Mount Desert Island, sitting adjacent to Somes Sound. A hike up the steep and aptly-named "Goat Trail" quickly ascends the mountain to reach the summit. Despite the viewpoints being rather obscured by vegetation, a loop hike around Norumbega Mountain takes hikers through sublime thickly forested landscape, including a dense grove of young pines. The stroll along the shores of Lower Hadlock Pond is also worth the effort. Access: Norumbega "Goat Trail" Parking Lot along Route 3. The Norumbega Mountain roadside parking lot is located on Route 3 roughly 2.3 miles south of the junction of Route 198 and Route 233 (Eagle Lake Road). The Goat Trailhead is at the north side of the parking lot. Follow the "Goat Trail" as it makes a fairly steep ascent up the east face of Norumbega Mountain. While not as treacherous as many other peak hikes in Acadia, the trail does go up roughly 600 feet in .5 miles, crossing several steep rock faces along the way. As you get near the top and clear the lower forested area, be sure to look behind you to catch the best views of the hike looking northeast towards Bald Peak and Sargent Mountain far in the distance. 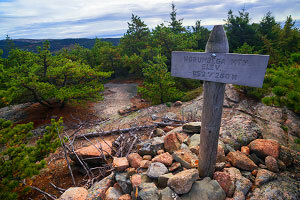 Soon enough, the trail turns south and levels out to reach the official summit marker of Norumbega Mountain. The actual summit may be a bit anti-climactic as views are obscured in all directions. Despite being high above and right next to Somes Sound, you can't actually get a good view down to the water or across to Acadia Mountain. While you could turn around at this point, it's more fun to continue south and make a loop hike. South of the summit marker, the trail is now officially called "Norumbega Mountain Trail" and it slowly descends the south side of the mountain, heading through some beautifully-forested sections, including a dense grove of young pines. At the base of the mountain, the trail reaches the shores of Lower Hadlock Pond right by the dam outlet and pumphouse. The pond is a reservoir so no swimming is allowed, but the stretch of trail heading north along its banks is quite enjoyable. 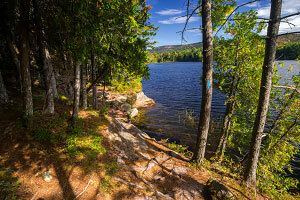 At the north corner of Lower Hadlock Pond, the trail leaves the reservoir and follows the rocky Hadlock Brook. A few trail intersections and cute wooden bridges are located here. Follow the signpost markers for the Goat Trail Parking. The final one-mile stretch along Lower Norumbega Trail goes through more densely-forested terrain. Soon enough you will be back at the parking area. This hike is a bit off the beaten path and has no jaw-dropping viewpoints, so it's probably not the most exciting choice for casual tourists. 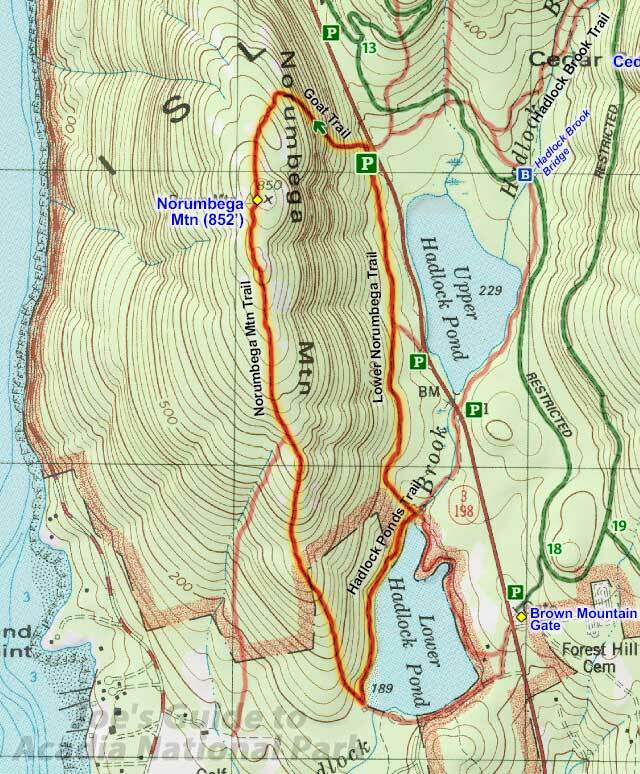 But the steep Goat Trail does make for fun hiking and the forested scenery and stretch of trail along the banks of Lower Hadlock Pond are quite memorable.